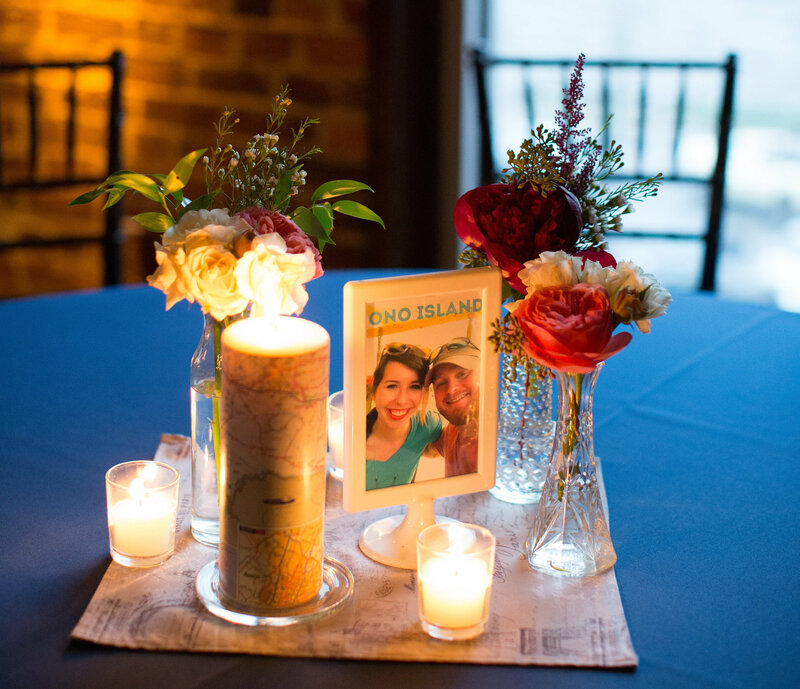 To pay homage to our love of traveling, my husband and I had a travel-themed wedding. Set the travel theme and tone of your the wedding with invitations that have map details. 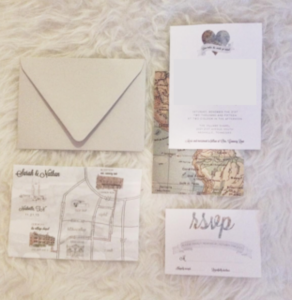 I love these invitations that were designed by Sea and Moon Designs. 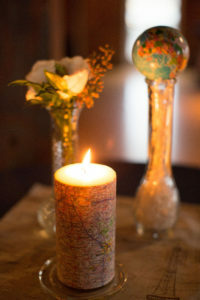 Our designer even created a hand drawn map of the route from the ceremony to the reception. Every table at the reception was labeled after a city that Nathan & I have visited. Each table had a picture of the two of us with the name of the city. 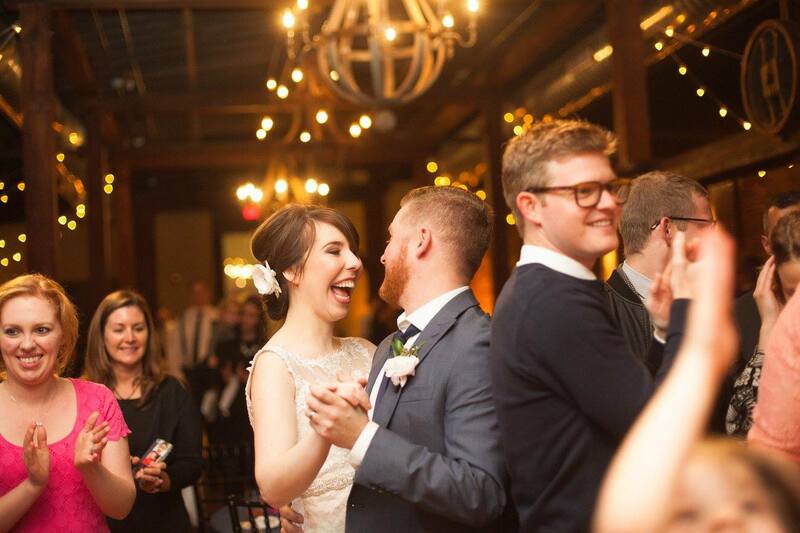 It was a fun detail and conversation starter. 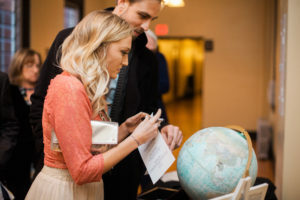 Instead of a guest book, we had a guest globe. My mother found a beautiful globe and white washed the exterior so that the signatures would pop. We had guests from all over the USA and world, so it was fun to see them sign over their hometowns. We proudly display the globe in our home now. My mom and I had a lot of fun with the details. She decoupaged candles with maps, sewed map and travel-themed handkerchiefs that were used as table centers and collected all different sizes of globes to decorate the reception (all the details my mom did were amazing…thank you thank you, Mom!). Make sure to add personal details. 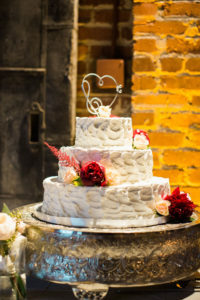 My husband and I are both musicians, so we also had music details infused into the decorations (ex: Our cake topper was a treble and bass clef shaped like a heart). Wedding planning can be stressful, but on your big day…soak up every moment, take in the promises that you’re making, enjoy each other & your guests, and have fun. Good to have you back GOSI!